“Sweetgrass” is a hard film to recommend. Not because I don”t want to recommend it, but because of what it is. It”s the kind of film where you can sometimes hear the projector behind you like a shuffling deck of cards — the kind of film you might have to watch in a class someday, if you ever take a class deeply concerned with the filming of sheep. It”s quiet and not overly contemplative, kind of grainy and populated by, let”s be honest, the most annoying farm animal ever. And yet, it”s still completely awesome. I think it might have to do with there being a lot of them. The star of Ilisa Barbash and Lucien Castaing-Taylor”s documentary is a critical mass: some 3,000 sheep crossing the Absaroka-Beartooth Mountains in Montana over a period of three months. You can tell they have different personalities because they produce a wide variety of bleats — Bette Midler, Barbra Streisand, Billy Corgan, etc. — and they run into each other a lot. In general, though, they compose a massive corpus of blaring whiteness, sort of like Bed, Bath and Beyond. The sheep are herded by two cowboy types who know the scale of their enterprise and feel its toll. The older, craggier gentleman tunes out the noise and the stress by napping against a tree, a hat over his face. In the film”s most memorable scene, the younger guy erupts into a tirade of anti-sheep invective while the camera surveys their formation from afar. We see a オンライン カジノ moving vista; on the ground, he sees a bus full of disobedient schoolchildren and calls them a bunch of cocksuckers. Multiple modes of spectatorship collide, each attempting to deal with the impossible magnification of sheepness. If you”re still entranced by the glossy, moisturized, bioluminescent perfection of the flora and fauna in “Avatar,” you”ll probably be disappointed by these off-white, dirty creatures. Each has a terrible haircut, recently shorn. You can tell that they”re implacably aware of the camera, but they”re probably not driven to showmanship by the holistic and discernible will of Eywa. Still, “Sweetgrass” recalls one of the most cathartic moments in James Cameron or any other filmmaker”s repertoire: the point at which the radar fills with blips, the ground quakes in anticipation and the animals arrive in full. I”m not recommending this movie because the sheep stampede kills Mufasa. I”m not recommending it because it has the sentimental value of “March of the Penguins” or the shock-value of the hundreds of dead bunnies in “El Topo.” It”s not like going to the zoo and it”s certainly not like “Meerkat Manor.” If anything, what it really lacks is a framing device — a metaphor, a narrative or Morgan Freeman”s stately voice. 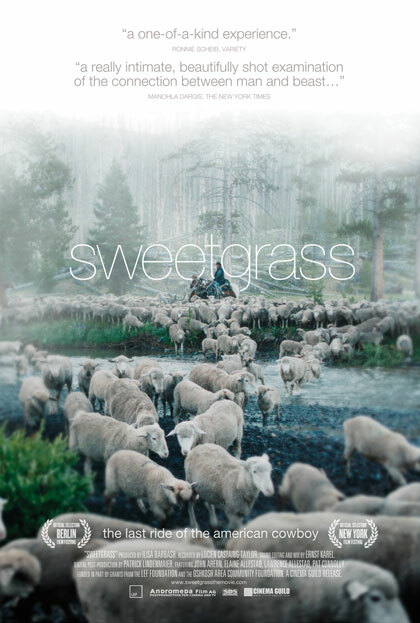 No, I”m recommending “Sweetgrass” because it”s pure cinema. It”s a constructed, artificial image that nonetheless makes you feel closer to the horde: a technological preservative with a biological imperative. When the sheep plow through a modern ghost town, kicking up dust in front of a lonely Radio Shack, it feels like a Western without people. More than anything else, it”s a truthful vision of something extremely potent, which is often all we”re looking for, whether we realize it or not. MATT MARGINI. NYU News. January 26, 2010.